Helbert must have spent quite a bit of money to produce a trap as complex as this; more than 25 pieces go into each trap and most are cast metal. A complicated locking system prevents the jaws of the “man trap” being pried apart once they close. To accomplish this, Helbert used four locking devices that must be simultaneously disengaged with a special key. The trap was to be set outside at the entrance to a chicken yard or near a hen roost and covered with dirt, straw or the like. When the trigger assembly was stepped on, the convoluted springs quickly closed the jaws. A heavy chain secured the trap to a fence post or stake, and the chicken thief awaited the embarrassing moment of confronting his captor. 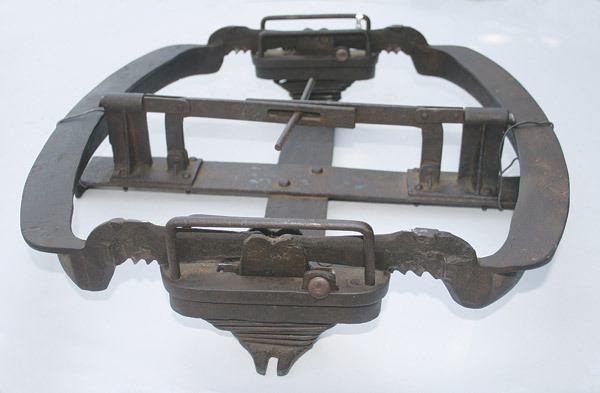 The flat jaws on the trap were offset two inches so as not to overly injure the leg they held. Fewer than six of these traps are known to survive in collectors’ hands. Because of this, it is difficult to give a market value, though it surely would be in the $1,500 range. In addition to the Chicken Thief, there are many other well-known man traps in collections around the country. I own two others, myself. Stuart Haddon-Riddoch’s book titled Rural Reflections—A Brief History of Traps, Trapmakers and Gamekeeping in Britain devotes an entire section to man traps. The Scotsman states that records show man traps were being made as early as 1770 and that the aristocracy set them throughout their estates to protect wild game and fruit crops from the hungry “peasants.” English trap maker Izons & Co. marketed a “humane” man trap in the 1830s. Trap makers Henry Haines and William Bullock & Co. also made man traps during this same time. The use of man traps was outlawed in Britain in 1861. Some of the bigger traps measure more than 5 feet across. However, many of the larger European traps, such as those made by Henry Lane, were actually designed to capture large, dangerous animals, such as lions, tigers and bears. They are only mistakenly called man traps. A true man trap usually has a lock mechanism built into the jaws to prevent escape.